FARMERS IN THE U.S. Corn Belt are facing a growing wave of glyphosate resistant weeds, including Palmer amaranth (Amaranthus palmeri), an alarming import from the desert Southwest. “The trajectory of resistance continues to increase,” says Dr. Micheal Owen, agronomy professor and extension weed specialist at Iowa State University. As serious a threat as Palmer amaranth is, it is not the only weed-resistance worry for U.S. farmers. Most of the top corn-producing states have also documented glyphosate resistance in horseweed or Canadian fleabane (Conyza canadensis), tall waterhemp (Amaranthus tuberculatus A. rudis), giant ragweed (Ambrosia trifida), and common ragweed (Ambrosia artemisiifolia) (see chart). Nebraska and South Dakota have found resistant Kochia (Kochia scoparia). CHART: GLYPHOSATE RESISTANCE IN THE U.S. CORN BELT. SOURCE: WWW.WEEDSCIENCE.ORG/SUMMARY/HOME.ASPX. COLORED CELLS INDICATE RESISTANCE CONFIRMED. Still, Palmer amaranth, also known as Palmer pigweed, is a top concern. A warm season summer annual, it emerges as soil temperatures warm and continues to germinate into the summer, especially after rainfall events. It can grow one to two inches a day and, under ideal conditions, go from germination to seed production in three weeks. A single plant can produce several hundred thousand seeds. “I’ve never seen 10-foot-tall weeds in a soybean crop,” declares Mike Mueller, a Missouri corn and soybean grower, after touring a test plot with uncontrolled Palmer. “I think everybody on the bus had the same idea as me. We were scared,” he says. “Palmer amaranth continues to spread. 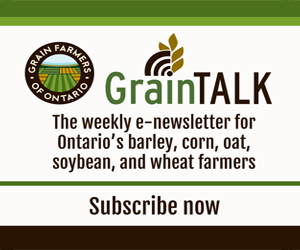 I wouldn’t be surprised for it to show up in Ontario the way it did in southwestern Michigan,” Owen comments, noting that Ontario is similar to the Corn Belt in its adoption of genetically modified technology and its use of glyphosate. In Corn Belt states like Iowa, Palmer amaranth has typically spread through the movement of farm equipment, but in other regions, like Michigan and northern Indiana, it has skipped long distances. “It’s moved in the gin trash from cotton ginning, which is shipped north to feed dairy cattle,” Owen explains. This year, Kansas offers a typical example of what growers face from resistant Palmer. “Glyphosate-resistant Palmer amaranth was first confirmed in Kansas three years ago but seems to be exploding across central Kansas this year,” reports Dallas Peterson, a Kansas State University agronomist and weed specialist. “If you can’t measure it with the length of your finger, it’s too late,” says Dr. Brian Young, a weed science expert at Southern Illinois University. Once established, Palmer amaranth roots go down well over 12 inches. Management is further complicated because Palmer can be hard to distinguish from red root pigweed (Amaranthus retroflexus) and some waterhemp. “Producers need to use an integrated approach to weed control that utilizes a variety of cultural practices and herbicide modes of action,” Peterson recommends. “The use of pre-emergent residual herbicides is probably going to be very important to help manage Palmer. If the herbicide treatment [glyphosate] provides good control of some plants and not others, that is an indication you may have resistance,” he says, suggesting it may be worth hand-removing scattered Palmer amaranth plants to prevent seed production.